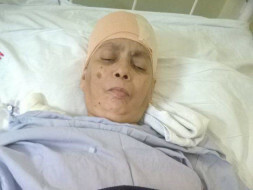 61-year-old Saeeda was the only earning member in a family of five sisters until she was diagnosed with a brain tumor. She had to be operated on immediately as her condition was critical, and is now in recovery. Although a major portion of the tumor has been excised, Saeeda needs aggressive treatment for the next few months to be completely out of danger. Saeeda's oldest sister is the only one in the family who is married. The other four sisters, including Saeeda became dependent on the income from the rent of their house for their livelihood until Saeeda left their village to work as a warden at a ladies hostel in Pune. They have seen hardship throughout their lives including the death of their only brother, mental illness of one of the sisters, and multiple health disorders in the family. Shafi, Saeeda's brother-in-law has been an incredible support to the family through the years, and especially now. "In December 2016, Saeeda began to complain of severe pain in her leg. We took her to the orthopedic, and he asked her to get a few blood tests done. We went back again after we got the results. It showed that her sugar levels were up, so the orthopedic asked her to visit a Physician. At that time she could walk slowly, with support. In just a day, her condition completely changed. She could not walk at all. We had her admitted to a nearby hospital. They said she needed to be under observation while they ran tests. The MRI showed signs of a brain tumor. The doctors said it is better to move her to a bigger hospital and we did. Again she had to be tested as the doctor felt it could be TB, but the MRI showed no signs of TB. They moved her in for surgery immediately as the tumor was in a risky position and there was no time to waste." Saeeda was diagnosed with Oligodendroglioma. These are tumors noticed within the cerebral hemisphere of the brain. Although they are fairly common in adults, it takes years to be diagnosed because it grows very slowly and hardly show symptoms until it reaches the final stages. "At first, everything seemed to take its time. Because of a Sunday, or the how long it took to get lab results, or when an appointment becomes available. All of a sudden things began crumbling around us so quick that there wasn't any time to think. We did not even have a second to think about funding the surgery or how we were going to pay the bills. Thanks to a very good friend of ours who was generous enough to step up at the right time, we were able to do the necessary at that moment, but now, we have to think about how we will get out of debt and continue with treatment to keep Saeeda alive." Saeeda cannot even go to work now so that income is gone. She might have to resign because it will take her over a year to recuperate from this nightmare. "She used to go to a park nearby every day. She was part of a Laughter Club. When they heard what happened to her, one of the members came and wrote a cheque for Rs. 10,000. The rest of them pooled funds and contributed Rs. 8,500. That's something we just cannot forget. They were the only people who came forward to help from her friends' circle." This family does not have much financial support to pay off the bills from the surgery and for the treatment that will help Saeeda successfully beat the tumor. "You won't believe if I tell you that not one person from the family has even called to inquire how she is doing. Nobody has come to even see what has happened, leave alone help her get through it." Your support can not only save Saeeda but also the family that depends on her. To say that we are overwhelmed by the response and generosity of people is an understatement! A big Thank you to each donor for your kindness and your kind words. 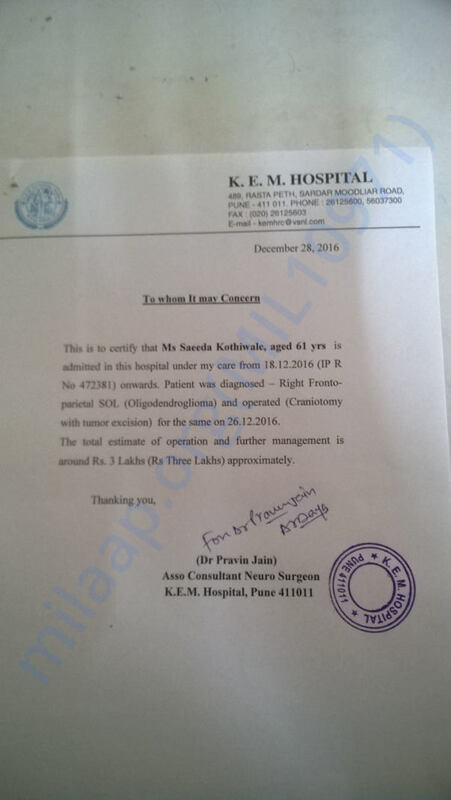 Unfortunately for our family, Saeeda's tumor was found to be cancerous. The oncologist has recommended 30 cycles of radiation to start with. 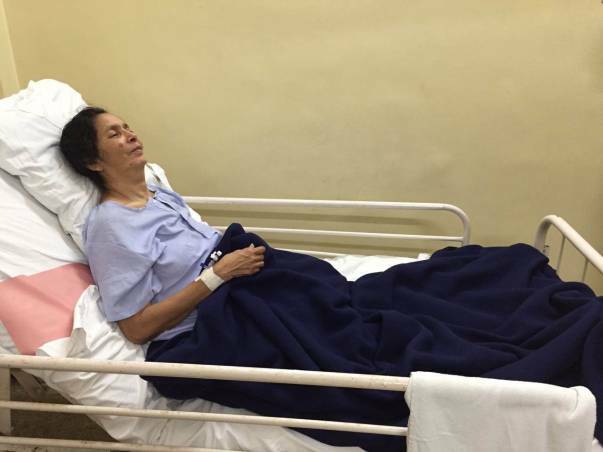 At this stage, after her brain surgery ,she has lost the use of her left side, she is bed ridden and requires assistance for everything. The strong medicines have also caused very painful haemorrhoids. She will need ongoing physiotherapy to help her regain some movement back on the left side. A few days back, we had no idea how we would be able to get her the help she deserves… After the hard life she has had, we want to give her every opportunity to live. Dear donors, your generosity has given Saeeda and the whole family a new lease on life! It is a kindness that we can never ever forget or repay. We thank you for what you have done from the bottom of our hearts. May each one of you be blessed a thousand times over!